It’s often the case that travellers go to Africa for the wildlife and return for the people. Travelling to Odzala-Kakoua National Park in the Republic of the Congo (also known as Congo Brazzaville) is a great example of this, a destination which draws people in with gorilla tracking, and yet results in on-the-ground meetings and guided walks with the conservationists dedicating their lives to saving a critically endangered species, and whose knowledge makes for the most extraordinary of experiences. I recently travelled there along with journalist Sophy Roberts, photographer Robbie Lawrence, and great ape conservationist Roland Purcell. It’s a wonderful destination, quite unlike any I’ve visited. It’s 13,500 km2, has just one 25 km road, and is home to 22,000 western lowland gorilla. Travel is on foot, through forest and bai (swamp clearings), courtesy of the routes or boulevards created by forest elephant. Leased to African Parks, the tourist concession looked after by the Congo Conservation Company, it operates a very low volume, high return tourism model. Off the back of the trip, Wild Philanthropy’s currently designing a conservation journey that provides travellers special access to the research, and offers rare opportunity to meet and spend time with those responsible for it. That research is largely the work of Dr Magda Bermejo and Germán Illera (University of Barcelona), currently based in the south of the park, at Ngaga Research Station, one the camps on our itinerary. Dr Bermejo and Illera have been researching great apes in Central Africa since 1991. They have already successfully habituated two gorilla groups. I was amazed to learn it takes three to five years of daily visits to habituate the gorillas to, says Bermezo, ‘observers’ presence’. Only then can they start to study the gorillas, and further along the line start to introduce tourists. Bermejo is now in the final stages of habituating a third focus group. Bermejo and Illera’s research was originally based in the Lossi Sanctuary. Unfortunately, they had to move following the Ebola outbreak ape die-offs in 2002 and 2003. 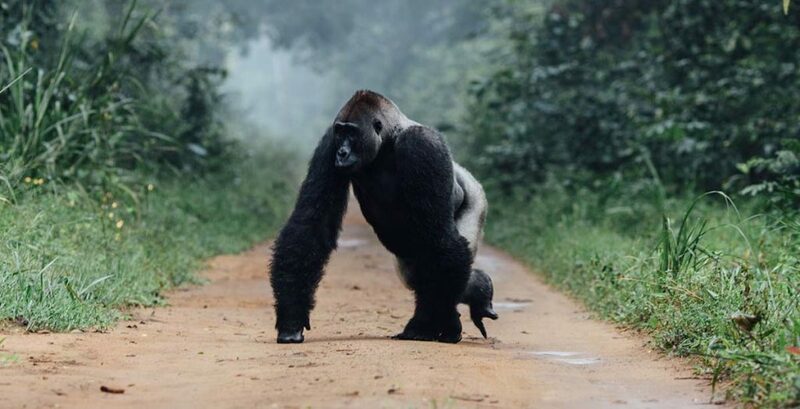 According to Bermejo, their research points to a ‘the massive die-off scenario, with gorilla mortality rates of 90 to 95%, as indicated both by observations on 238 gorillas in known social groups and by nest surveys covering almost 5,000 km2.’ Indeed, ZEBOV (an Ebola strain) killed about 5,000 gorillas in their study area alone. For the gorillas to be protected in the long-term, it is of fundamental importance that the local community is involved. The site where Bermejo and her team now work is in close proximity to several villages. Habituating the gorillas means they start to accept humans, opening up a whole new dialogue. Some of her work now focuses on educating the local community, on how to live with and respect their gorilla neighbours. This makes it the perfect study site for the investigation of the human-gorilla interface, and the potential for examining any human-wildlife conflict. In all of this, Barmejo and the team at Ngala Camp know only too well how important the right kind of tourism is. Their work is largely funded by revenue from Conservation Fees, gorilla tracking permits and profits from the camp. However, it’s not just about funding. Just as important are the benefits of people coming face-to-face with the the gorillas. ‘Each person,’ says Bermejo, ‘has a precious and personal thing to learn from them.’ It’s the rarest of experiences, and one that makes conservationists of us all. If you would like to more about Wild Philanthropy’s conservation journey to Odzala-Kokoua National Park, or would like to help in any way with the conservation effort, please get in touch with Will Jones.